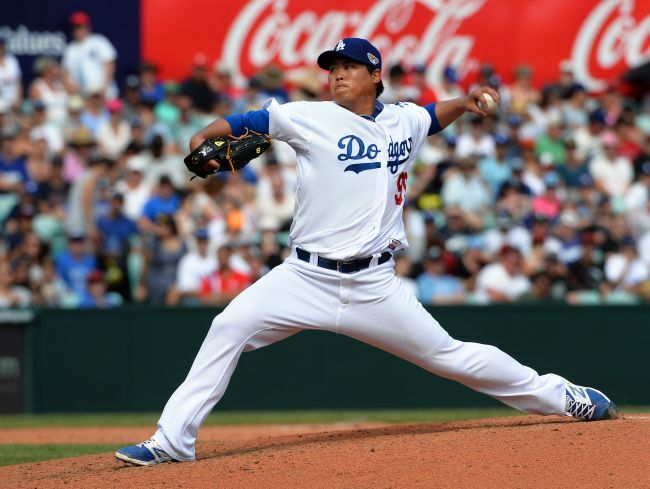 Los Angeles Dodgers' South Korean pitcher Ryu Hyun-jin has seen his up-and-down season end with a loss to the Boston Red Sox in the World Series, his future beyond this year still uncertain. The Red Sox defeated the Dodgers 5-1 in Game 5 of the World Series at Dodger Stadium in Los Angeles on Sunday (local time), clinching their ninth title and leaving the Dodgers in search of their first championship since 1988. Ryu made history by becoming the first South Korean to start a World Series game, when he took the mound in Game 2 last Wednesday. But the left-hander was the losing pitcher in the Dodgers' 4-2 defeat after getting charged with four earned runs in 4 2/3 innings at Fenway Park in Boston. Ryu would have been in line to start Game 6 if the Dodgers had been able to extend the series. The 31-year-old was also trying to become the second South Korean player, after Kim Byung-hyun with the 2001 Arizona Diamondbacks and the 2004 Red Sox, to win a World Series ring. This was Ryu's second full season back from shoulder and elbow surgeries that limited him to one regular season start across 2015 and 2016. And after going 5-9 with a 3.77 ERA in 25 games last year, Ryu bounced back nicely to post a 7-3 record and a 1.97 ERA in 15 starts in 2018. He missed three months of action after suffering a groin injury in May, but came back even stronger in the second half than earlier in the year. Ryu closed out the regular season by holding opponents to one earned run in his final 19 innings. Ryu was left off the Dodgers' postseason roster in 2017 as they made it to the World Series and lost to the Houston Astros in seven games. But this year, Ryu was the surprise Game 1 starter over staff ace Clayton Kershaw in the National League Division Series against the Atlanta Braves. The South Korean made manager Dave Roberts look prescient, as he tossed seven shutout innings and struck out eight in the Dodgers' 6-0 victory. But Ryu did not have another outing like that the rest of the postseason. He started Game 2 and Game 6 of the NL Championship Series against the Milwaukee Brewers -- both on the road -- and gave up seven earned runs in 7 1/3 innings combined. Though Ryu's road numbers weren't nearly as strong as his home records, Roberts still sent Ryu out to Game 2 of the World Series in Boston. Ryu was solid through the first four innings but couldn't get out of the fifth after recording two outs. That was Ryu's final postseason appearance, and may also have been his final game as a Dodger. A former MVP-winning All-Star in the Korea Baseball Organization, Ryu signed a six-year, US$36 million deal with the Dodgers in late 2012. He became the first South Korean to jump from the KBO to the big leagues. Ryu won 14 games in each of his first two years before coming down with shoulder labrum injury that wiped out his 2015 season. He made one start in 2016 before undergoing elbow surgery. The 2018 season was encouraging for the pending free agent, and his three shaky postseason starts notwithstanding, Ryu bolstered his case for a decent contract this offseason. The US media have speculated that the Dodgers could make him a qualifying offer during the winter. Teams hoping to receive compensatory draft picks for losing their free agents can make a one-year qualifying offer, which is worth the mean salary of the 125 highest-paid players. This year's qualifying offer will be reportedly valued at $17.9 million. A player has 10 days to accept or reject the qualifying offer. If the player declines the deal, then he will be free to test the open market. And a team that signs that player must give his previous club one or more draft picks. Since Ryu will be 32 next season and has a history of injuries, teams pursuing free agent arms may feel he isn't worth $17.9 million a year on the open market. After the World Series defeat, Ryu told South Korean reporters that it was too early to talk about his free agency. Asked if he has pitched in his last game in a Dodgers uniform, Ryu said, "We'll see what happens." Ryu said losing is always tough to swallow, but he looked back on his six seasons with the Dodgers fondly.